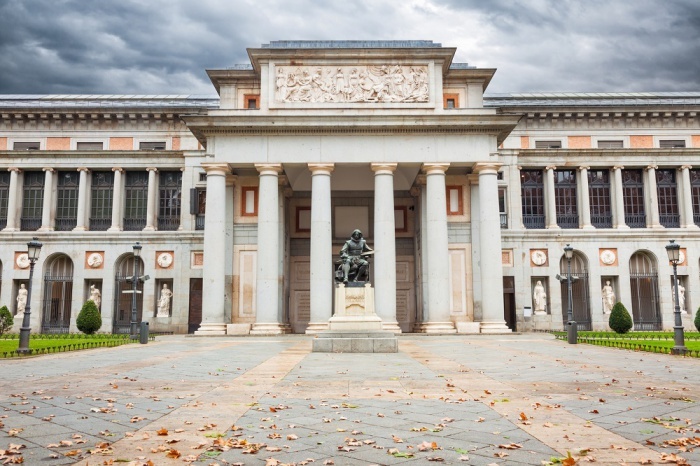 The Prado Museum in Madrid was opened in 1819 by Philip II and his father Charles V. They had a sincere love for the paintings of the painters popular at that time — Veronese, Tintoretto, Titian. They were supported by representatives of the following royal dynasties. They continued to expand the collection, and El Greco, Rubens and, of course, Goya and Velasquez were included in it. The museum building was erected long before its opening — in 1785 by order of King Charles III. The grandson of the king decided to give the building under the museum, which today is called the Prado. At that time, the Prado National Museum was created to display the luxury and wealth of the royal court, as well as to prove to the world — painters from Spain are not inferior in skill to artists from other European countries. In 1936, because of the civil strife that erupted in the country, the Prado Museum was closed, and all the canvases were taken to Switzerland. Again it opened in July of the same year, but part of the work remained abroad for a long time. They returned back to Spain only a few years. In 1971, the museum opened a branch with new spacious halls. It housed a collection of painters from Spain. Today, Prado is visited annually by more than two million people. The guide opens new rooms to present as many paintings as possible to visitors. In 2007, modern buildings appeared that harmoniously fit into a single architectural ensemble with the old museum building. Today, the «Prado» stores about 8,600 paintings, 1,000 sculptures, historical documents and decorative objects of art. But for all to see, due to the lack of exhibition space, only about 2000 works are displayed, the rest are kept in warehouses and hidden from the public. It is impossible to inspect all the works presented here during one visit. Art lovers come here repeatedly and spend hours on end, enjoying the beautiful canvases of great artists. Prado’s business cards are the world-famous works of Three Graces by Rubens, Goya’s Black Paintings, Wander Weyden’s Descent from the Cross, David Caravaggio’s David and Goliath, Bruchel’s Garden of Earthly Delights by Bosch . The largest collection is represented by paintings by artists Goya and Velasquez. The paintings of Spanish painters here are about 4800, including works by artists Ribera, Alonso Cano, Zurbaran, El Greco and others. More than a thousand paintings in the Prado Museum belong to the brush of Italian artists. They were collected and carefully kept in the bins of the royal court for several centuries. Most paintings were created three or four centuries ago. Of greatest interest are the works of Italian artists Titian, Botticelli, Fra Angelico, Tintoretto and many others. It contains over a thousand paintings by painters from the north of Europe. Among them are Jan van Eyck, Hieronymus Bosch, Jacob Jordaens, Peter Paul Rubens. The number of paintings of the latter reaches 90, most of them hit the Prado Museum after visiting the country as a painter. Noteworthy works in the Prado Museum, belonging to German, French, English, Dutch painters. Despite the fact that their expositions are not so large-scale, they are still very interesting and are a reflection of the tendencies of European painting of past centuries. Also in «Prado» are regularly held thematic exhibitions of works of different directions of painting. The building is located in the center of Madrid at Paseo del Prado street, s / n 28014. You can get here by buses No. 9, 10, 14, 19, 27, 34, 37, 45, as well as by train to Atocha station. From the airport, it is convenient to take the metro to Banco de España station with two transfers at Mar de Cristal and Goya stations, and on buses number 101 and 200. The museum is open from Monday to Saturday from 10.00 to 20.00, on Sundays and public holidays from 10.00 to 19.00. The cost of a regular ticket is 14 euros, with an audio guide — 23 euros *. Students and children can visit the museum for free.